From tantrums to tummy aches to teenage mood swings, there are times when a book is the best medicine of all. 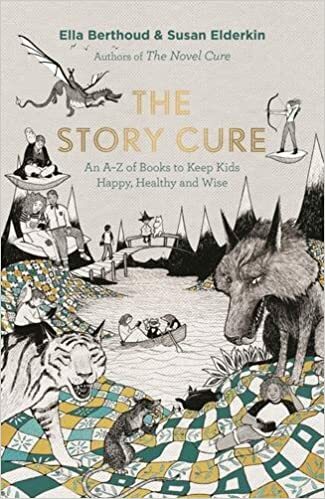 The Story Cure is a manual for grown-ups who believe that the stories which shape children's lives should not be left to chance. In these pages bibliotherapists Ella and Susan recommend the perfect children's book - from picture books to YA novels via the golden world of chapter books - for every hiccup and heartache. Whether the young child you know is being bullied, the toddler can't sleep, or the teenager has fallen in love for the first time - or just doesn't know what to read next - the right story will help them feel themselves again. Packed full of helpful lists of the best books to read when turning ten or going through a spy/horse/superhero phase, you'll find old favourites such as The Borrowers and The Secret Gardenalongside modern classics by MT Anderson, Malorie Blackman and Frank Cottrell Boyce. The Story Cure is the perfect companion for initiating young readers into one of life's greatest pleasures. In a spate of cases across the country, Airbnb is opening up a line of attack that pits Internet freedom against land use regulation. The shield Airbnb seeks to use these days is primarily the Communication Decency Act Section 230, which provides that, "No provider or user of an interactive computer service shall be treated as the publisher or speaker of any information provided by another information content provider." Airbnb is arguing that this broad provision protects it against a host of regulations and fines. For an analysis of some of the broader implications of how CDA is applying to short-term rental regulation, you might check out a podcast I did last month with Jamila Jefferson-Jones (UMKC) for the ABA Real Property Trusts and Estates Section, which is available here for RPTE Section members. The company, which operates in a regulatory gray area around the globe, is also fighting tough battles in Amsterdam and Barcelona, Spain, which penalizes hosts who list illegal rentals, and in Berlin, which has banned most short-term rentals. The new law in New York allows authorities to fine hosts up to $7,500 if they are caught listing a property on a rental platform such as Airbnb. “New York is taking a bold step that will hopefully set a standard for the rest of the country and other countries in the world that are struggling with the impact of Airbnb on affordable housing,” said Assemblywoman Linda B. Rosenthal, a Manhattan Democrat who sponsored the bill. Airbnb, which has tripled in value in just two years to $30 billion, is fighting hard against any regulation that would affect the number of hosts on its platform. The company cannot expand without a steadily increasing number of hosts, and its rental revenue growth could slow as more cities around the world move to push potential providers off the platform. The New York law is particularly worrisome for Airbnb. New York City is the company’s largest market in the United States. The city’s hosts generated about $1 billion in revenue last year, and the company took a cut of that amount in fees. The lawsuit was filed against Eric T. Schneiderman, the state attorney general, Mayor Bill de Blasio and the City of New York. New York lawmakers, including State Senator Liz Krueger, one of Airbnb’s primary legislative foes, counter that they had the Communications Decency Act in mind when they drafted the bill, which is why it holds the hosts responsible for advertising illegal listings and does not impose any fines on Airbnb. For the first time in 12 years, [Center on Budget and Policy Priorities] CBPP has an opening for a new Housing Policy Analyst to join our team in the DC office. I think you all know our work well enough to appreciate what a good career opportunity this could be for someone with a masters’ (or J.D.) who is interested in making an impact on housing policy. The person in this position will focus (at least initially) on funding and policy reforms for federal rental assistance, particularly the Housing Choice Voucher program, but the scope of work may expand as opportunities arise. We’re looking for a really smart, insightful analyst with excellent communications skills and a deep commitment to making poor people’s lives better. Please share this announcement with people you think would be interested and qualified (check out the job posting at http://www.cbpp.org/careers/policy-analyst-housing). Salary really is commensurate with experience – we’re open to mid-level people as well as those recently out of grad school. We hope to have the new analyst begin work in January. The meeting overview is provide below. Full conference details are also attached, for your convenience. Public Service Project: Native Health Community Garden, 4221 N Central Ave.
Be sure to check out the new interactive collection of maps, Mapping Inequality: Redlining in New Deal America, which allows viewers to look through the original risk maps created by the Home Owners' Loan Corporation. As most readers know, these maps started with the presumably good intention of stabilizing communities during the Great Depression; however, in grading communities, and thus determining the availability of federally-back mortgages, HOLC relied heavily upon racial factors. Later termed "redlining" for the red color of the often African-American communities on these maps, racial segregation deepened because red communities on the maps had difficult times receiving mortgage assistance. Seeing this in a neighborhood you know, and the blatant terms coded onto the forms, brings home how a good idea in theory--assessing property--became one of the most harmful racial tools in American history. It seems it would be a valuable teaching tool. Here are several maps, one of the entire country and another screenshot from my hometown of Dayton, where the colors match up almost precisely with the racial distribution in that city during mid-century. The “wildland-urban interface” is a term commonly used but seldom precisely understood. There is good reason for that: the meaning of the term varies tremendously. There are at least three important ways to think about the WUI: as a policy definition; as a legal definition; and as a variable concept that changes along with development patterns over time. This variation does not indicate the term is “meaningless”; it does mean, however, that context matters and such context must be closely evaluated throughout the WUI wildfire planning process. Independent of these policy definitions, there are additional legal definitions of the WUI that are especially important for wildfire planning. Many wildfire-related laws and regulations apply specifically to the WUI, but different laws can have different requirements for how the WUI is defined. For instance, the Healthy Forest Restoration Act of 2003 (HFRA) provides a complicated definition of the WUI. On the one hand, if a community has adopted a WUI definition in a CWPP, federal agencies will abide by that determination. If no community has not done so, however, an alternative default definition is supplied. This CWPP map presents a legal WUI definition for Teton County that covers all of the private property—including urban areas, commercial properties, infrastructure and other community amenities—and some federal lands in the county. This illustrates that the legal definition of the WUI under HFRA can vary substantially from the default rule when a community undertakes to define the process. This map also illustrates that the legal definition of the WUI for purposes of HFRA provided by this map can also vary from policy definitions of the WUI, which would typically not include urban areas such as the cities within the county. In this legal WUI definition that applies to the President’s executive order, there is only a small portion of Teton County in the WUI even though, for purposes of HFRA, all private property in the county is within the WUI. The purpose of investigating this difference is to illustrate that legal definitions of the WUI can vary, even among legal tools. In planning for wildfire, it is important to make sure that all relevant legal considerations are addressed in defining the WUI both for compliance with federal and state laws, but also for integrating with planning, building, and fire functions of local governments. For instance, coordinating the CWPP definition of the WUI with a local government’s definition of the WUI in its comprehensive plan and development codes facilitates the alignment of federal, state and local policies. In particular, it ensures that different departments within larger local governments—such as fire departments, planning departments, and building departments—are working toward a common vision of the areas subject to WUI wildfire risk and thus necessitating additional wildfire preparedness. Finally, it is important to remember that the concept of the WUI is a fluid one. As development occurs, an area that was once the WUI may become a bona fide suburb or even a town center of its own. Similarly, as properties undertake mitigation efforts such as hazardous fuel treatments or building construction changes, WUI risk levels can change. For this reason alone, WUI wildfire planning requires an ongoing process that responds to the pace and scale of development along the urban fringe. See Office of Inspector General, U.S. Dep’t of Agric., Audit Report: Forest Service Large Fire Suppression Costs i n. 1 (2006), http://www.usda.gov/oig/webdocs/08601-44-SF.pdf, archived at http://perma.cc/9YDE-LS2P; see also Urban Wildland Interface Communities Within the Vicinity of Federal Lands That Are at High Risk from Wildfire, 66 Fed. Reg. 752,753 (Dep’t of Agric. Jan. 4, 2001) (notices) (defining the WUI as “where humans and their development meet or intermix with wildland fuel”); Headwaters Econs., Solutions to the Rising Costs of Fighting Fires in the Wildland-Urban Interface 5 (2009), http://perma.cc/45TW-GLVU (In the western states, “on average 3.2 acres per person are consumed for housing in the wildland-urban interface, compared to 0.5 acres per person on other western private lands.”). Urban Wildland Interface Communities within the Vicinity of Federal Lands That Are at High Risk from Wildfire, 66 Fed. Reg. 752,753 (Dep’t of Agric. Jan. 4, 2001) (notices). Office of Inspector General, U.S. Dep’t of Agric., Audit Report: Forest Service Large Fire Suppression Costs, at i n. 1 (2006), available at http://www.usda.gov/oig/webdocs/08601-44-SF.pdf. Travis B. Paveglio et al, Categorizing the Social Context of the Wildland Urban Interface: Adaptive Capacity for Wildfire and Community “Archetypes,” 61(2) For. Sci. 298, 300 (2014). (iii) an area that is adjacent to an evacuation route for an at-risk community that the Secretary determines, in cooperation with the at-risk community, requires hazardous fuel reduction to provide safer evacuation from the at-risk community. 16 U.S.C. § 6511 (2016). Ex. Order No. 13728, 81 Fed. Reg. 32223 (May 18, 2016), available at https://www.whitehouse.gov/the-press-office/2016/05/18/executive-order-wildland-urban-interface-federal-risk-mitigation. Sebastiín Martinuzzi et al., The 2010 wildland-urban interface of the conterminous United States (2015), http://www.nrs.fs.fed.us/pubs/48642. A useful video history of California's Proposition 13, which began the Seventies' tax payer revolts. Jesse and Randee Elizondo (the “Elizondos”) appeal the district court's denial of their motion to preliminarily enjoin the City of Junction City (the “City”) from cutting down a tree located in front of their residential property. The district court also did not abuse its discretion in denying preliminary injunction on the Elizondos' Equal Protection Clause claim. The Elizondos can succeed on their claim only if they show that they were intentionally treated differently from other similarly situated property owners, and that the difference in treatment lacked a rational basis. See Gerhart v. Lake Cty., Mont., 637 F.3d 1013, 1022 (9th Cir. 2011). The evidence does not show that they were treated differently than other similarly situated property owners. As the district court noted, the situations of other property owners cited by the Elizondos were not sufficiently similar because they did not present all of the unique issues posed by the maple tree in front of the Elizondos' property, including its location on an intersection, which created a visual setback in violation of the thirty-foot requirement of the municipal code, caused the surrounding sidewalk to buckle, and obstructed the installation of an Americans with Disabilities Act-compliant ramp. Moreover, the City provided multiple rational bases for its decision. The City's decision to remove the tree was based on legitimate considerations of the high costs of alternatives and the aesthetics of maintaining a uniform street design. JESSE ELIZONDO & RANDEE ELIZONDO, Plaintiffs-Appellants, v. CITY OF JUNCTION CITY; MIKE CAHILL, Mayor of Junction City; RANDY NELSON, City Council President; BILL DEMARCO; HERB CHRISTENSEN; JIM LEACH; KAREN LEACH; & STEVEN HITCHCOCK, City Council Members, Defendants-Appellees., No. 16-35129, 2016 WL 6092405, at *1 (9th Cir. Oct. 19, 2016). The City of Junction City, Oregon, through the individual named defendants, decided to cut down a tree that is over 100 years old, stating varying reasons for removing the tree. None of those purported reasons are supported by the evidence. The tree is on plaintiffs' property, within the right of way for sidewalks. Plaintiffs have located a 1910 photograph in the local historical museum *3 which shows the tree in its infancy, in front of the home that still stands and is now owned by the plaintiffs. CR 20, ER 78 (Second Decl. of Elizondo, Ex. H). (The impression is that the tree was planted by the property owner, as there are no public plantings of trees in that photograph). The Elizondos have submitted the tree for nomination for “Oregon Champion Tree” status. CR 20, ER 79 (Ex. I). The tree provides valuable habitat for hawks; migratory birds such as herons; and other birds and wildlife. CR 8, ER 67-68. In addition, the tree provides shade and aesthetic benefit to the neighborhood and to tree-lined Sixth Street in Junction City, Oregon, in particular. So, it is actually a really old tree. Makes more sense. Here is a video about the tree. In a weird way, the tree case is a great teaching point about how many different laws--equal protection, ADA, street design, due process and more--can come in to play about something as simple as whether a tree lives or dies. My latest op-ed on planning for wildfire is here. This is the opening day of Habitat III in Quito. Many of the events are being live-streamed here. 11. We share a vision of cities for all, referring to the equal use and enjoyment of cities and human settlements, seeking to promote inclusivity and ensure that all inhabitants, of present and future generations, without discrimination of any kind, are able to inhabit and produce just, safe, healthy, accessible, affordable, resilient, and sustainable cities and human settlements, to foster prosperity and quality of life for all. We note the efforts of some national and local governments to enshrine this vision, referred to as right to the city, in their legislations, political declarations and charters. 12. We aim to achieve cities and human settlements where all persons are able to enjoy equal rights and opportunities, as well as their fundamental freedoms, guided by the purposes and principles of the Charter of the United Nations, including full respect for international law. In this regard, the New Urban Agenda is grounded in the Universal Declaration of Human Rights, international human rights treaties, the Millennium Declaration, and the 2005 World Summit Outcome. It is informed by other instruments such as the Declaration on the Right to Development. (h) protect, conserve, restore, and promote their ecosystems, water, natural habitats, and biodiversity, minimize their environmental impact, and change to sustainable consumption and production patterns. We seek outstanding candidates with interdisciplinary expertise and experience in policy and planning disciplines relevant to urbanization, sustainability, resilience, climate change, and equity. The specialist will work collaboratively with faculty from different departments on campus, including those within the School of Architecture & Planning, School of Law, and others to develop and support environmental science and policy research. We anticipate that the Specialist will spend 50% time developing new research programs and 50% time working on providing support to existing research programs, including developing large interdisciplinary grant proposals to support research programs. Minimum qualifications: Minimum educational requirements include a Master's degree in city/urban/regional planning, law, management, public policy, public administration, sociology, or a related discipline. A Ph.D., J.D., or other doctoral degree in one of these fields is preferred. Work experience of 4-5 years beyond the Master's degree or two years beyond a doctoral degree is required. A proven record or strong drive toward team research, a strong record of research publication, and proven ability to write grant proposals are all desirable skills. Research skills including statistical, geographic and qualitative analysis are highly desired. Applicants should submit a CV highlighting relevant experience and names of at least three references via the UBJobs system (https://www.ubjobs.buffalo.edu/). Review of applications will begin September 26, 2016 and will continue until the position is filled. Salary/compensation will be dependent on educational background and experience. For additional information, please email renew@buffalo.edu. About RENEW: The Institute on Research and Education in Energy, Environment and Water (RENEW) at the University at Buffalo (UB) aims to advance Energy, Water and Environmental Sustainability as a foundation for a regenerative economy through interdisciplinary research cutting across UB's academic organizations. The institute's interdisciplinary focus involving the faculties of the School of Architecture and Planning, College of Arts and Sciences, School of Engineering and Applied Sciences, School of Law, School of Management, School of Public Health and Health Professions, and the School of Medicine and Biomedical Sciences is designed to foster new collaborations and innovative ideas. The initiative taps the leadership and vision of deans and faculty at these seven schools and colleges. The institute engages over 100 faculty members in these seven schools. Further details can be found at http://www.buffalo.edu/renew/Employment-Opportunities.html. In 1995, fire made up 16 percent of the U.S. Forest Service’s annual appropriated budget; in 2015, wildfire consumed more than 50 percent of the agency’s budget, a benchmark reflective of steadily rising costs. At the same time, while 91 percent of federal appropriations for wildfire management are allocated to protect federal lands, it is increasingly clear that federal funds are being used to protect private homes and other structures “adjacent to federal lands [that] can significantly alter fire control strategies and raise costs.” In a survey of Forest Service land managers, estimates were that “[fifty] to [ninety-five] percent of firefighting costs were attributable to protection of private property.” Moreover, a study conducted for the Montana legislature found that firefighting costs are “highly correlated with the number of homes threatened.” A recent study of wildfires in Wyoming found that protecting just one isolated home added as much as $225,000 to the overall cost of fighting a fire. The rising cost of fighting fires and, in particular, those that threaten private property, has many factors including terrain, fuels, and weather. Increasingly, though, attention is being directed to the rapid growth of remote developments—especially those not designed or maintained with wildfire in mind—at the urban periphery often referred to as the “wildland-urban interface,” or WUI (pronounced “Woo-E”). There is good reason why attention is turning to these types of developments: six of the 10 most expensive fires in the past 100 years were WUI fires despite the fact that WUI fires account for just a small fraction of overall fires fought in any given year. According to one widely used WUI definition, only 14 percent of the WUI is developed. If current development patterns continue, development in the WUI will almost certainly grow substantially, resulting in even further increases in wildfire protection costs. With the Mountain West perennially ranking as one of the country’s fastest growing regions, this WUI development is certain to grow over time. As this growth occurs, certain mismatches in process will be exacerbated. Local governments retain authority to approve WUI development through applications of local zoning, building, fire, and subdivision codes even though it is typically the federal government that bears the greatest burden in protecting—and has the greatest resources to protect—those developments from wildfire. A few local governments in the West are integrating a deep knowledge of wildfire protection policy into their planning and development processes. More collaboration is necessary to build an enduring solution to wildfire near development. Subsequent posts on the blog will focus on these pioneering communities that are trying out new approaches to planning for wildfire, and what the rest of the West can learn from them. U.S. Forest Service, The Rising Cost of Wildfire Operations: Effects on the Forest Service’s Non-Fire Work 2 (2015), http://www.fs.fed.us/sites/default/files/2015-Fire-Budget-Report.pdf. Ross Gorte, Headwaters Econs., The Rising Cost of Wildfire Protection 7, 14 (2013), http://perma.cc/W4GX-PNGF. Office of the Inspector General, U.S. Dep’t of Agric. Audit Report: Forest Service Large Fire Suppression Costs ii (2006), http://www.usda.gov/oig/webdocs/08601-44-SF.pdf, archived at http://perma.cc/9YDE-LS2P; see also Urban Wildland Interface Communities Within the Vicinity of Federal Lands That Are at High Risk from Wildfire, 66 Fed. Reg. 752,753 (Dep’t of Agric. Jan. 4, 2001) (notices) (defining the WUI as “where humans and their development meet or intermix with wildland fuel”). Headwaters Econs., Montana Wildfire Cost Study Technical Report18 (2008), http://perma.cc/D7U5-BBUA; see also Patricia H. Gude et al., Headwaters Econs., Evidence for the Effect of Homes on Wildfire Suppression Costs 14 (2011), http://perma.cc/Y9CB-R3AY (finding the same in a similar study conducted in California). Costs in the Wildland-Urban Interface 3 (2015), http://wyoextension.org/agpubs/pubs/B-1268.pdf. William E. Mell et al., The wildland–urban interface fire problem – current approaches and research needs, 19 Int’l J. of Wildland Fire 238, 239 (2010). See Headwaters Econs., The Rising Cost of Wildfire Protection 1 (2013), http://headwaterseconomics.org/wphw/wp-content/uploads/fire-costs-background-report.pdf. Headwaters Econs., Solutions to the Rising Costs of Fighting Fires in the Wildland Urban Interface 5 (Dec. 2009), http://headwaterseconomics.org/wphw/wp-content/uploads/HeadwatersFireCosts.pdf. Tomorrow, my colleagues and I will officially unveil our new 167-page guide entitled Planning for Wildfire in the Wildland-Urban Interface: A Resource Guide for Idaho Communities. The guide includes a novel four-step process to guide wildfire planning, over 30 examples of code provisions from throughout the West, the results of a large wildfire risk perception study, and more! If you are in Boise, please come and join us for the unveiling of the guide in a joint presentation with Idaho Smart Growth on Wednesday, October 5 from 6 - 7:30 PM in Room 325 of the Idaho Law & Justice Learning Center (514 W. Jefferson Street in Boise). On the blog, I plan to offer a series of posts that convey much of what we learned, and what we propose, that is applicable to wildfire planning not just to Idaho, but to communities throughout the West. Through the project, we also came to believe that wildfire planning is still very much in its infancy; for that reason, we are calling this guide a "Discussion Draft." Over the next two years, we will be engaged in a variety of outreach activities as well as several projects where we actually work with communities to try and implement the method of wildfire planning that we propose here. After those experiences, we admit that we may well revise the method we propose; at the very least, we know we will have a deeper understanding of what works, and what doesn't. We plan to incorporate that "earned knowledge" back into the guide in an updated version. The price of wildfire in the West has never been higher. Why? And what can Western communities do about it? One way to measure the price of wildfire is the dollars spent on suppression alone. In 1995, fire made up 16 percent of the U.S. Forest Service’s annual appropriation budget; in 2015, wildfire consumed more than 50 percent of the agency’s budget, a benchmark reflective of steadily rising costs. A recent study of wildfires in Wyoming found that protecting just one isolated home can add $225,000 to the overall cost of fighting a fire. But the price of fire is also told in lost recreational opportunities, scarred landscapes adjacent to city centers, loss of wildlife habitat, presence of invasive species, and increasingly, after-effects such as flood and landslides, that can cause even greater long-term harm to a community that the initial fire. Although fewer wildfires occur in the WUI compared to timberlands or rangelands, they are of increasing concern for several reasons. First, WUI fires are expensive to fight. Six of the ten most expensive fires in the past 100 years were WUI fires. Further, the WUI is relatively undeveloped. By one account, just 14 percent of the WUI is developed, leaving a vast potential region of growth that, if developed without wildfire in mind, could yield staggering costs as the West grows. Finding ways to prevent “locking in” long-term, high cost development patterns, while still encouraging such development and growth, is a threshold issue facing Western property owners, taxpayers, and governments. The amount of science and technology dedicated to addressing wildfire in the WUI issues is substantial: decades of research provide a rich array of knowledge about fire from which to draw. The missing piece of the puzzle is the planning and legal framework that would apply that knowledge to protect property and lives from fire. How can we use planning, law and incentives to implement what we already know about wildfire and keep our communities safe? The proposal offered by this guide is a conceptual framework that local communities—governmental and non-governmental—can use over time. The framework, which this guide calls the “WUI Wildfire Planning Process,” consists primarily of a four-step, cyclical planning process that revolves around the inter-governmental National Cohesive Strategy Vision and Goals for wildfire, and is supported at all times by education and outreach. Although little known outside of the fire community, the National Cohesive Strategy Goals are simple, but important, goals established through a five year planning process (2009 to 2014) in which federal agencies, state, tribal and local governments, as well as non-governmental parters, built a common vision of how the country could address wildfire. The three goals of the Cohesive Strategy are maintaining landscapes; developing fire-adapted communities; and developing a multi-jurisdictional wildfire response based upon risk-based decisionmaking. These Cohesive Strategy Goals are the core around which the WUI Wildfire Planning Process revolves. The four active steps of the WUI Wildfire Planning Process are illustrated below. They are: draft and adopt a community wildfire protection plan (CWPP); regulate and incentivize the built environment at all scales; implement, maintain and enforce regulations and incentives; and respond to substantial changes such as wildfires or the passage of time. The conceptual framework illustrates a progression of planning that leads to successful and well-informed results; however, wildfire experts know well that variations on these components and order can also yield successful wildfire planning results. For purposes of beginning a dialogue about best practices for wildfire planning, the framework forms the backbone of the guide from which other discussions grow. Community wildfire protection plans are an excellent place to begin wildfire planning for several reasons. A creature of federal law, CWPPs actually permit local communities to have a say in how wildfire on federal lands is maintained, which is a major concern for many Idaho communities. Further, CWPPs make communities eligible for federal funding opportunities; such opportunities will grow as CWPPs are increasingly integrated into county All Hazard Mitigation Plans and, if properly updated every five years, will make wildfire hazards eligible for even more funds. CWPPs are also important because they provide a framework for identifying wildfire risk at an ecological scale that permits local communities to think beyond their jurisdictional boundaries precisely because the process includes federal, state, tribal, and local government and non-governmental participants. One of the limiting factors in the success of CWPPs in Idaho in the past has been that they have been conducted solely at the county level and by a select group of fire community individuals. While county CWPPs are clearly still valuable, Idaho Department of Lands seeks to encourage the preparation of CWPPs at multiple scales, as contemplated by federal law and practiced in other Western states. For instance, a county-wide CWPP may be supplemented by a city CWPP and even a neighborhood CWPP conducted by a homeowner’s association that has a particular wildfire hazard. Each scale permits a different level of preparedness and analysis that is valuable. CWPPs could also be more valuable by increasing the scope of participation to include others that will facilitate wildfire decisions in other parts of the process. This would mean including local officials, local staff, and a proposed citizens’ advisory board, in addition to the traditional fire staff, in the CWPP process. The second step in the process is for a local jurisdiction—a city or county—to decide on the package of regulations and incentives it will utilize to address the identified wildfire risk. Doing so requires local governments to decide whether to allow development in areas of high wildfire risk and, if they do so, to decide how to respond with local values related to regulatory versus incentive-based approaches and the successes of each in relation to the risk. The guide discusses several approaches that have worked well in other communities, which include: seeking co-benefits, such as open space, that may matter locally; seizing upon interest that often arises after a wildfire; choosing an approach that the community can support; and anticipating for wildfire’s after-effects, especially flood, landslide, aesthetic harm, and economic development issues. There is no one-size-fits-all approach to wildfire. For some communities, a simple approach could be to focus on the basics: defensible space, metal roofs, and weed ordinances to reduce fuels. This simple, effective solution can work very well in rural areas. More urban areas will likely want a solution that fits the complexity of the built environment. Regulatory tools are discussed at the community scale, such as comprehensive plans, specific plans, and land use zoning overlay districts; the neighborhood and subdivision scale; the individual site or project scale; and the building scale. Non-regulatory tools are equally important and can supplement regulatory tools, or stand-alone. They include the popular Firewise program, which is a valuable educational tool but which often yields uncertain results; insurance, which has a role to play in pricing fire risk; and homeowner’s associations, which are increasingly popular in Idaho and have served as a vehicle for local communities to provide enhanced wildfire security for their community independent of government regulation. Once regulations and incentives have been adopted, they must be applied to specific projects and enforced over time; similarly, incentive programs must be implemented and examined to determine efficacy. This third step may be the most important—it is where ideas yield results—but it is also an especially hard step for wildfire. That is because many of the factors associated with wildfire risk reduction require maintenance—of buildings, of landscaping, of cleanliness near structures—that collides with the entitlement-driven development process that prioritizes one-time, up-front conditions of approval. This section of the guide begins by discussing the importance of communication between local government departments to address precisely this issue. The section then turns to the types of enforcement mechanisms that are being tried by some Idaho communities, but also communities throughout the West. These include homeowner association CC&Rs that make local governments the third-party beneficiaries of wildfire-related maintenance agreements; using the development agreement process to plan for wildfire upfront; using zoning to require maintenance; as well as re-tooling nuisance ordinances to address wildfire. The section also discusses some non-enforcement mechanisms, such as disclosure techniques that prioritize informing property owners of the wildfire risk on their lands, and how to mitigate it. Other approaches include cities that conduct wildfire fuel reduction work for private property owners so long as they sign a maintenance agreement for on-going upkeep of the mitigation. The fourth, and final step in the process occurs when there is a substantial event, such as a wildfire, or even a secondary effect like a flood or landslide, that causes the local community to realize that it needs to re-evaluate, and re-visit its wildfire planning strategy. In addition to such an event, the passage of time becomes its own reason to revisit a wildfire planning strategy, if only because WUI demographics change quickly; an exurban community one year could be a bona fide bedroom community in a decade. In addition, as Idaho moves to integrate CWPPs into All Hazard Mitigation Plans, the CWPPs will need to be reviewed every year and revised every five years for compliance with AHMP regulations. The combination of wildfire events and the passage of time give local communities a number of reasons to revisit their approach to planning, determine what has worked and what has faltered, and create an amended plan going forward. Although a community’s planning process may not follow this conceptual framework precisely, the frame provides a way to contemplate how to use all of the tools available to maximize wildfire preparedness. Along the way, education remains a vital component of wildfire planning, both to communicate the nature of wildfire risk but also what it means to be prepared to face that risk. To that end, Appendix A to the guide provides significant excerpts of codes from Idaho local governments, and some other local governments from throughout the West, to serve as models for similarly-situated communities. This discussion is also enriched by the inclusion of a robust risk perception survey, which was conducted by surveying nearly 20,000 Idaho households in wildfire priority areas throughout the state in Fall, 2015 and Winter, 2016. The guide provides significant helpful data worthy of review. The most telling questions, however, may be those that reflect sentiment toward local regulation of fire. Approximately 55% of respondents stated that WUI codes should differ from other areas that are less fire prone. Support for more restrictive code and regulation exists with 46% answering yes, 23% maybe, and 30% no. When asked whether they would be willing to pay a premium to be more “Firewise,” about 15% stated yes, about 36% maybe, and probably not combined with definitely not are almost 49%. When asked whether they would support legislation to be more “Firewise,” about 37% stated yes, about 27% maybe, and probably not combined with definitely not are almost 35%. A strong majority (68%) of respondents stated that they see themselves responsible to protect home and property. A small minority (18%) of respondents stated that they see the local fire department as responsible to protect their home and property. About 43% believe that the city or county government is responsible to protect home and property, whereas 37% do not believe this is the city or county’s role, and about 18% are not sure. About 63% believe that the city or county government is responsible to protect public lands, whereas 23% do not believe this is the case, and about 19% are not sure about it. The survey data indicates that there is a political base for both regulation- and incentive-based approaches to wildfire, but local communities will have to make the case to those who are on the fence and unsure that all would be better off with some wildfire planning. This is redoubled by the fact that additional survey results indicate that many believe that their own homes are safe despite acknowledging nearby fire risk to others. Making the case for wildfire planning requires understanding the problem and the methods we have to solve it. This guide is a place to start, but it is just a beginning. This version is labeled a discussion draft. Over the next several years, the research team will host a variety of educational engagements across the state. The guide will change in response to local feedback and the conversations that evolve about fire over time. The goal will be simple: to find local answers that keep wildfire from exacting the price that is inevitable in the status quo, something none of us can afford. In 2015, the U.S. Forest Service and the Idaho Department of Lands provided a grant to scholars at the University of Idaho and Boise State University to address planning for wildland-urban interface (WUI) wildfires throughout Idaho’s varied terrain and communities. In the first phase of the project, law students in the Economic Development Clinic at the University of Idaho College of Law’s Boise campus contacted all 200 Idaho cities and 44 Idaho counties to determine the status of existing wildfire regulations and incentives. In addition, the Clinic also collected and reviewed all 44 of Idaho’s county wildfire protection plans, which were generally written between 2003 and 2007, as well as updates to those plans currently underway in several counties. At the same time, Boise State University’s Public Policy Research Center conducted a risk perception study to understand how Idahoans relate to wildfire risk. In the second and third years of the grant, the University of Idaho’s Bio-regional Planning and Community Design program will join the effort, coordinating workshops around the State to assist local communities to find locally appropriate approaches to planning for wildfire in the WUI. Planning for Wildfire in the Wildland-Urban Interface was a collaboration and the first product of the grant; many people deserve credit. Other authors of the guide include Thomas Wuerzer, Associate Professor for Real Estate Development, Nova Southeastern University (formerly of Boise State University); Eric Lindquist, Director, Public Policy Research Center, Boise State University; Jaap Vos, Program Head, Bioregional Planning & Community Design, University of Idaho College of Art and Architecture; Molly Mowery, Wildfire Planning International; Tyre Holfeltz, Idaho Department of Lands; and two students from my Economic Development Clinic, Brian Stephens and Alexander Grad.